I'm a staunch believer of love, truth and honesty. Thats why I absolutely adore animals.They have all these qualities in abundance! Since many years now, I've wanted to help animals in any way I can but I will also truthfully admit that I haven't done much. A few days back, I came across a video on facebook which showed a dog who had been completely submerged in tar. 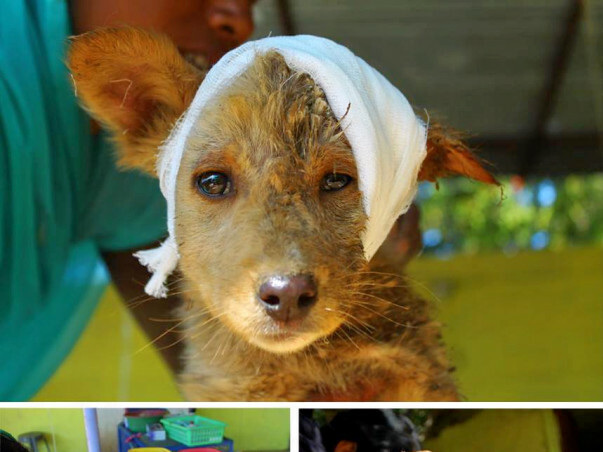 He was rescued by a team from an NGO named Animal Aid Unlimited. I researched about them, watched their other videos and read their write-ups on the official website as well. It was all extremely moving. Thus, I decided to start this fundraising for these helpless and beautiful creatures who are as much a part of this beautiful planet as are we. It's our moral duty to do our bit for the welfare of these speechless souls who do not ask anything in return for their unconditional love and faithfullness except for our companionship. Animal Aid Unlimited is a life-changing place in Udaipur, Rajasthan, India for the rescued animals. Founded in the year 2002, its mission is to rescue and treat the stray, escaped, neglected or abused animals of the city. Here, they are given a second chance at life with utmost love and care. Their ultimate goal is equality and protection for all the animals irrespective of their size, behaviour or whatever their chances of survival are. They are working day and night so that each dog, donkey, cow, pig, fish and mouse is free to live their lives in freedom and joy. The ultimate goal they have set for themselves is to provide safety and good facilities for as many needy animals as they can round up or rescue. Since its inception,this NGO has rescued more than 45,000 injured animals. Even a fraction of help can make a huge difference. If at any time in your life you have wanted to undertake some charity work for the betterment of those who are less fortunate than you and me, do take some time and give this a thought. 500 Rs may not be a big deal to you but it will make a difference to some innocent life which doesn't stand much of a chance today. All the money that will be raised via this project will be donated to Animal Aid Unlimited. For any doubts,you can always contact Clarie Myers at: 09602325253, 09950531639, 09829596637. Please visit their website http://www.animalaidunlimited.com/. I am extremely hopeful that together we can make this happen. I am aiming towards collecting INR 100000(GBP 1000). The gap between the contributions and the target amount of 100000 Rs will be filled by us. I will begin by being the first one, to kick off this endeavour.